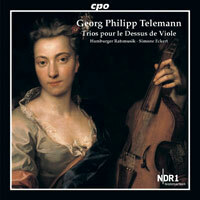 GEORG PHILIPP TELEMANN (1681-1767): 9 Trios with Treble Viol: TWV 42:d7, G8, g6, F6, c3, C2, A10, e5 and g9. Description: These pieces date from between 1712 and 1721, a time when the favorite instrument of French connoisseurs had finally become quite popular in Germany. In five of the nine the viol shares the melodic material with an oboe and in the other four with a recorder, while viola da gamba, harpsichord and theorbo/baroque guitar do continuo work. Hamburger Ratsmusik; Simone Eckert (dessus de viole).